Salem, OR (June 20, 2015) Matt Johnson has joined Studio 3 Architecture as an architectural intern. Matt Johnson is an intern architect at Studio 3 Architecture. He received his Bachelor of Architecture degree from the University of Oregon School of Architecture and Allied Arts in 2015. Originally from Salem, Johnson is enthusiastic about contributing to the development of his hometown.Johnson is especially passionate about the impact that the built environment can have on individuals and communities. Matt was also featured in Salem Chamber of Commerce in October (page 5). 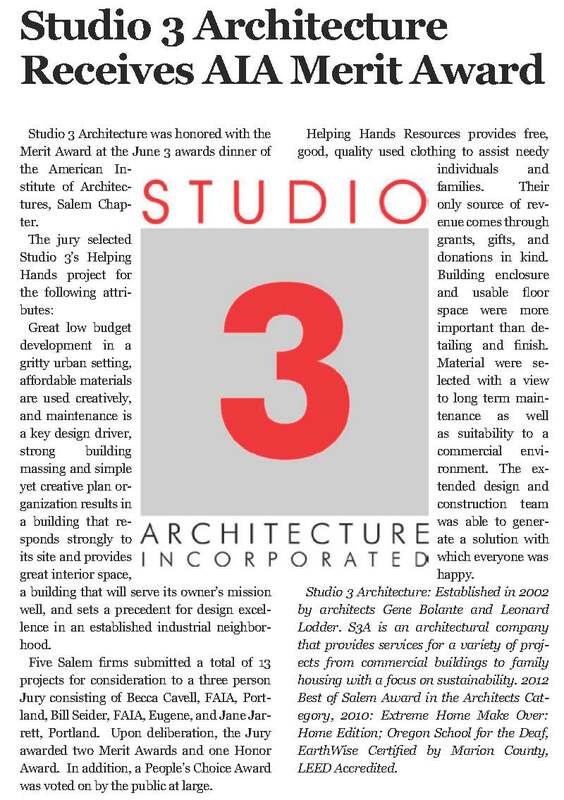 ABOUT STUDIO 3 ARCHITECTURE: Established in 2002 by principle architects Gene Bolante and Leonard Lodder. S3A is an architectural company that provides services for a variety of projects from commercial buildings to family housing with a focus on sustainability. 2012 Best of Salem Award in the Architects Category, 2010: Extreme Home Make Over: Home Edition; Oregon School for the Deaf, EarthWise Certified by Marion County, LEED Accredited. Salem, OR (April 28, 2015) Jim Toporek has joined Studio 3 Architecture as an architectural intern. Toporek received his bachelor’s degree from the University of Oregon School of Architecture and Allied Arts in 2014. Growing up in the Midwest, he worked as a carpenter while studying at Gateway Technical College in Racine, Wisconsin, where he earned an Associate Degree in Civil Engineering Technology. Toporek holds LEED (Leadership in Energy & Environmental Design) accreditation and is committed to sustainability through design. Toporek said he was drawn to architecture by the social responsibility and client accountability of the profession. “It is a profession where designers are entrusted with creating spaces where moments and days are spent, where lives begin and end,” he said. Toporek is involved in the young architects program of the American Institute of Architects. Salem, OR (Jan. 6, 2014) Sarah Harris has joined Studio 3 Architecture as a new architectural intern. Harris received her bachelor’s degree from the New School of Architecture and Design in San Diego. She is very passionate about the environment, and focused the later part of her architectural education on ecotourism and structures that work in harmony with nature. She recently received a certificate in Ecotourism Planning and Management from Humboldt State University. Studio 3 Architecture is located in downtown Salem and can be reached at 503-390-6500 or www.studio3architecture.com. Rich Duncan Construction is pleased to announce the construction for the new twelve operatory dental clinic in Salem. Breaking ground in early summer, Oak Park Dental will be the new home for Dr. Dan O’Leary and staff at completion of the project in December 2014. A state-of-the-art facility, with more than 6,000 sf, will offer the dental practice a large space to provide their patients with a broader range of additional services and enhanced patient care. See the full article and photo with Gene Bolante on p. 5 of the Salem Area Chamber of Commerce Business Voice. Salem, Ore. (May 10, 2014)- Caylia Richardson has joined Studio 3 Architecture as an office administrator. Richardson holds a BA in Business from Western Oregon and an Associates of Business Management from Linn Benton Community College. Studio 3 Architecture is owned by Leonard Lodder and Gene Bolante. 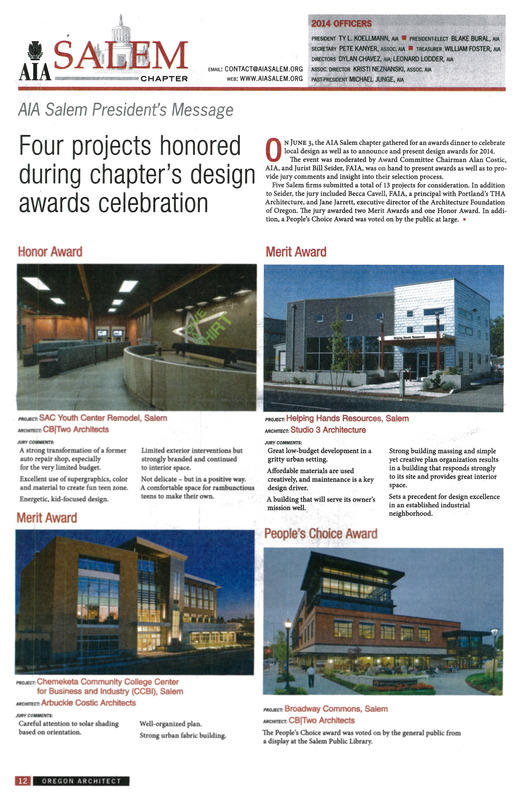 Their office is located in downtown Salem and can be reached at 503-390-6500 or www.studio3architecture.com. ABOUT STUDIO 3 ARCHITECTURE: Established in 2002 byprinciple architects Gene Bolante and Leonard Lodder. S3A is an architectural company that provides services for a variety of projects from commercial buildings to family housing with a focus on sustainability. 2012 Best of Salem Award in the Architects Category, 2010: Extreme Home Make Over: Home Edition; Oregon School for the Deaf, EarthWise Certified by Marion County, LEED Accredited. At Studio 3 Architecture, Inc. sustainability is important both in the buildings we design and in our everyday office operations. We have a robust recycling program in addition to other sustainability practices such as only using “green” cleaning products that are third-party certified. We are also proud of the standards our Green Team has established, especially our new sustainability purchasing policy. Studio 3 Architecture was retained to assist in the design and development of the new Boy’s Dormitory for the Oregon School for the Deaf.